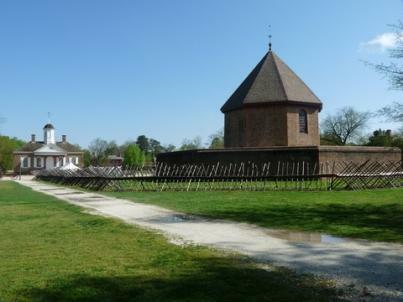 Williamsburg is located in the southeastern part of Virginia and is best known for Colonial Williamsburg, a restored 18th century town of 88 original and 40 reconstructed buildings. It is Virginia's most popular attraction and hosts visitors of all ages. Just outside of Williamsburg is the original settlement at Jamestown and Yorktown, a vital revolutionary-era battlefield. The region is also home to a Busch Gardens Amusement Park, numerous wineries, the Williamsburg pottery studio, and a large outlet center. The restoration of Colonial Williamsburg began in 1926 with the inspiration of local pastor, W.A.R. Goodwin, and the financial support of industrialist John D. Rockefeller. Today, the restored area is a convincing recreation of how Williamsburg might have looked during its peak in the early to mid-18th century. Over 120 buildings have been restored or recreated, including the original Capitol Building, the Governor's Palace, and the octagonal Magazine, which stored gunpowder for the militia. The gracious, brick Bruton Parish Church has been in continuous service since it was constructed in 1715. The College of William and Mary is the second oldest institution of higher learning in the United States (after Harvard). Located adjacent to Williamsburg's restored area, William and Mary is a delightful mixture of youthful enthusiasm and venerable history. The imposing Wren Building, designed in 1695 after the work of British Architect Christopher Wren, links the college and the restored area. William and Mary has educated presidents and statesmen, including Thomas Jefferson, James Monroe, Henry Clay,and John Marshall. More recently, the college has trained entertainers, Glenn Close and Jon Stewart. Today, the school is home to around 5500 undergraduate and 2000 graduate students, and is known for its small classes and small teacher-to-student ratio. Jamestown's First Church, located just outside of Williamsburg, is the site of the first permanent English settlement in North America. Established in 1607, Jamestown Island is a swampy piece of land in the middle of the James River. The original settlers, primarily English farmers and Polish woodcutters, faced a host of hardships, including weather, disease, famine, and drought. The island was used as a Confederate stronghold during the Civil War and later as a way station for runaway slaves headed for Canada. Today, the Jamestown National Historic Site encompasses 22 acres at the western end of Jamestown Island. The original three ships that brought the colonists from England have been recreated and are open to tourists. Yorktown, located about 30 miles from Williamsburg, is where English General Cornwallis surrendered to George Washington in 1781, ending the American Revolution. Nine buildings survived from the Revolutionary period and have been restored as historic sites. Yorktown was also a strategic supply center during the Civil War and served as the base for General McClellan's Army of the Potomac during that conflict. Today, visitors can tour the battlefield, restored buildings, historic Grace Episcopal Church, and the old Yorktown courthouse. The city's riverfront has been converted into an entertainment center with shops and eateries lining the Riverwalk. History buffs will love visiting this plantation located on the James River. It is one of the oldest in the United States and is the birthplace of President William Henry Harrison, who was born in 1773. Berkeley was also the location of the first American Thanksgiving in 1619. In addition, Taps was composed here in 1862 when it served as headquarters to General McClellan. The thrilling theme park offers everything from traditional rides to heart-stopping thrills to country-themed shops. Visitors can enjoy Busch Gardens year-round with special events at Halloween and Christmas. Rent one of 26 colonial replicas furnished with all of the modern conveniences. Each house is a replica of a different, period house ranging from one to two bedrooms to an 11-bedroom tavern style version that is perfect for large families and school groups. This is an ideal way to immerse yourself in the history of the region. Located on North Henry Street, this is a plain, serviceable hotel with 200 rooms. Visitors can also enjoy an outdoor swimming pool. The Inn is closed in January and February. The inexpensive rooms make it a great choice for a range of visitors. A traditional, Southern plantation style mansion is home to a full English Regency hotel experience on the inside. Built originally by John D. Rockefeller, Jr., the luxury experience was Queen Elizabeth II's choice on two separate U.S. visits. The resort offers golf, a gym, tennis courts and a freestanding spa. Located at 420 Prince George Street, the restaurant offers a variety of American, French and regional dishes ideal for a host of different palates from the conservative to the experimental. Sunday's a la carte brunch is popular with locals and visitors alike. Make reservations and check out the menu online. Located at 410 Duke of Gloucester Street, The Cheese Shop is well known beyond the Williamsburg region for its legendary sandwiches and cheese offerings. Reasonable prices and a wide selection make The Cheese Shop a great place for lunch or dinner. Discover adventure, history and fun in Williamsburg. Whether you are vacationing for business or pleasure, the city offers a wide range of amenities, historical gems and modern conveniences.